I made these pajamas last month, but just got around to taking photos last night. I’ve been wearing them a lot! Portrait of a crazy cat lady. I got my inspiration for this pose from a couple of photos I found on Google Images. I tried to get Bonnie to be in the shot with me, but the little diva wanted nothing to do with it. I don’t like the feel of labels, so when I sew pajama bottoms I like to do stitch in a little square at the center back. Collar detail. Instead of adding piping I just topstitched all around. Detail where the front facing meets the hem. Instead of finishing the facing with a serger I added a 3/8″ seam allowance and turned it under before stitching in place. Burda 12-2006-125 is my go-to pattern for when I want to make flannel pajamas. I think this is the fifth time I’ve used this pattern. Pajamas are cheap and readily available in RTW, but I like to make my own because the length is usually too short, and the flannel is often thin, poor quality, and some boring plaid or snowflake print. I prefer thick and beefy flannels, even if they don’t drape as nicely. I bought six yards because flannel usually shrinks a lot. 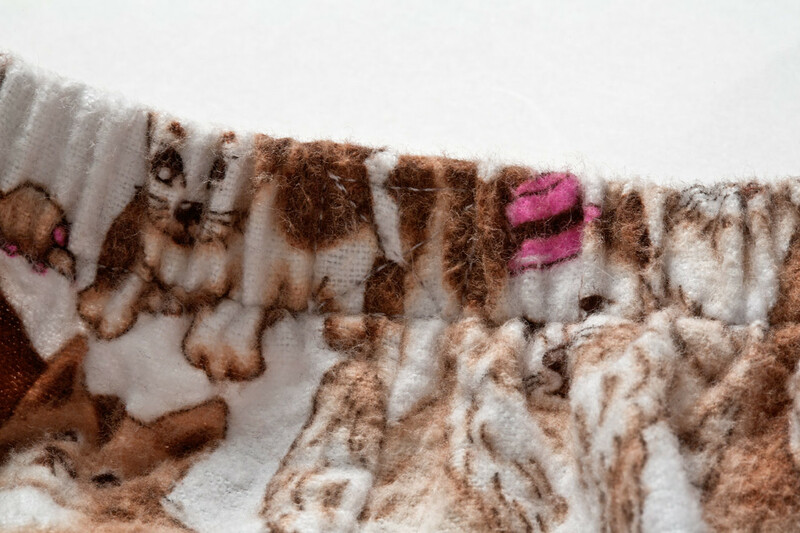 You probably noticed that I didn’t do print matching – if I did, I probably would have had to buy 12 yards! Since the print is busy enough on its own – and I couldn’t find my cording – I decided to skip on the piping. I also omitted the pockets and hem band details. I cut a 38 top and 44 bottom. Added 5/8″ “body space” to the back crotch curve by slashing the pattern horizontally at where the back crotch curve starts to curve upward, then sliding it over 5/8″ toward the side seam and truing the side seam curve afterward. Cut the elastic to the size 38 rather than 44 measurement. When I did the waistband for the pants I didn’t do a casing as recommended in the instructions. Instead I decided to finish it like I would finish the waistband on a pair of knit pants. I sewed the ends of the elastic together, placed it against the wrong side of the pants, and serged it to the flannel, stretching it to fit. I used the longest stitch length possible on my serger to avoid overworking the elastic. Then I folded the upper edge of the pants over and stitched it in place with my regular sewing machine. Much quicker than doing a traditional casing, and less bulky too. The downside is that you have to be fairly certain about your elastic measurement- no easy adjusting after the fact, unless you’re willing to unpick those serger stitches. It is also a good idea to make the elastic a little bit more snug than you would with a casing, since the woven fabric will stretch it out a little bit more than it would for a knit. For my light source I used a single 24″x36″ square softbox about 45º to my right, positioned high and aimed down toward my face. A large silver reflector was placed directly to my left to help fill in the shadows. My background was Savage seamless background paper in Super White. It comes off as light gray in the photo because I don’t have the room (or extra strobes) necessary to “blow out” the background to make it pure white like they do in e-commerce shots. These are so cute! I really need to sew up a set of pj’s. I have long legs and RTW always comes up comically short… And yes, I also miss the old fabric.com–they’re current website is so annoying to navigate as well! Yeah, I’ve gotten burned too by the legs being barely long enough…then they shrink 1″ after being washed. I think a lifetime of dealing with too-short hems is why I sometimes go overboard when it comes to adding length. 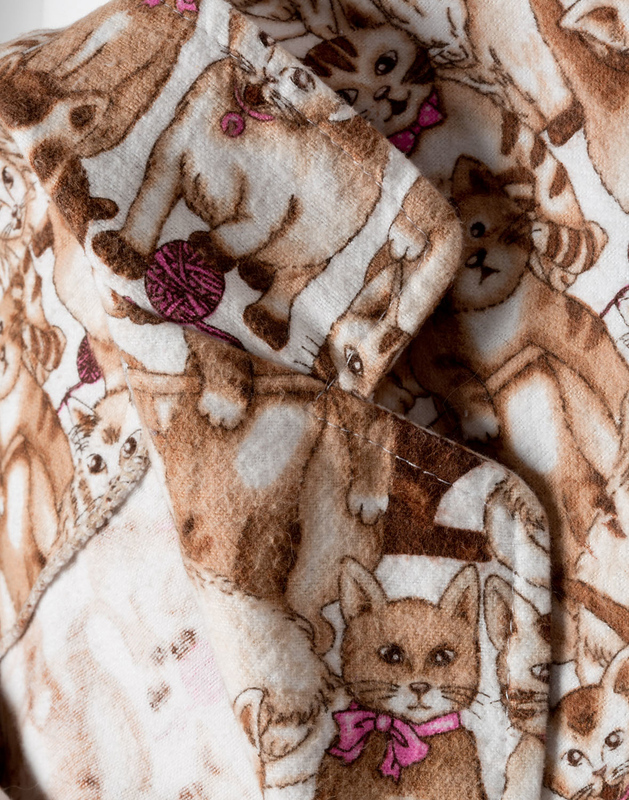 From one crazy cat lady to another – love the print! For fabrics I like a wider depth of field, especially at this magnification. I already had it on a tripod and wanted to play with the bulb setting, so it wasn’t a big deal. 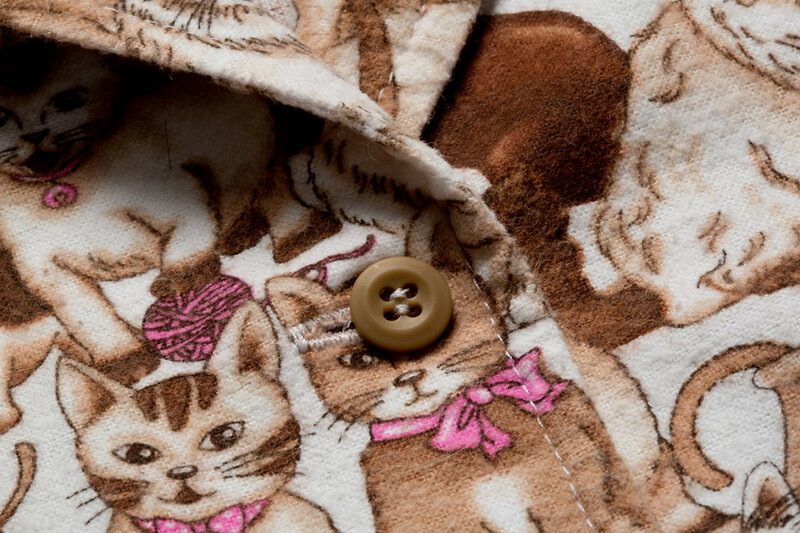 Your pjs look so comfy and the cat motif is so cute. I too make my own flannel pajamas due to the poor quality flannel found in ready to wear. I’ve had RTW flannel pajama bottoms with flannel so thin and loosely woven that they lasted for about three wears before falling apart at the crotch curve, inseam, etc. Nice job! 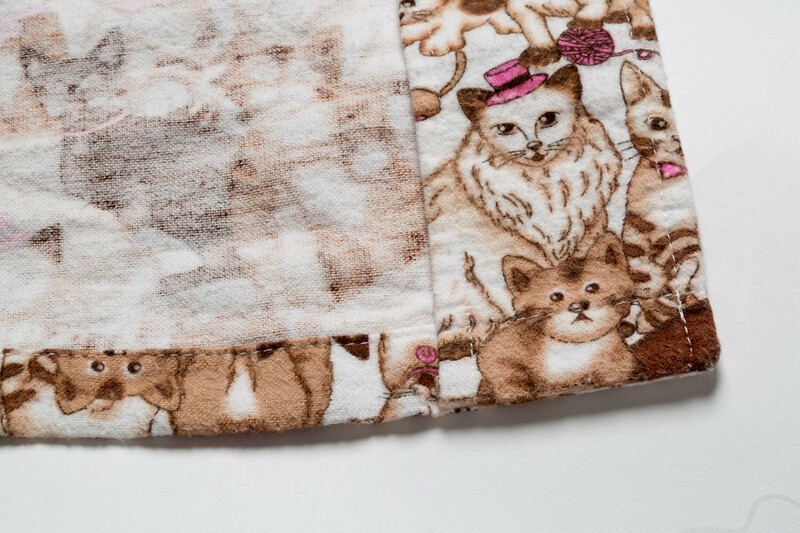 The print is perfect (we are the ‘authorities’ of three cats). They will never do as asked, unless it’s dinner time. And it’s a perfect time for flannel pjs. Well done. 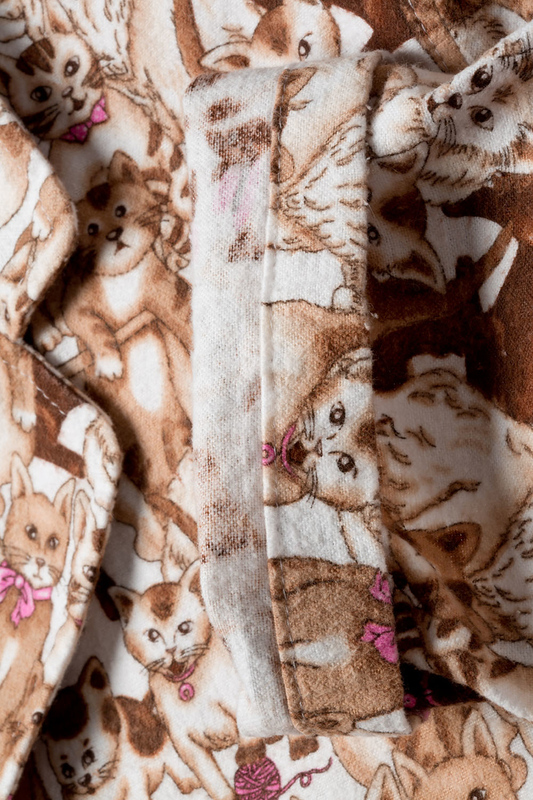 I would never, ever wear a print like this in public…but for PJs, why not? I just made a pair of pj pants out of a piece of vintage flannel covered in hunting dogs. Enjoy your lovely new pair of pajamas. She said “too commercial, I only do high fashion.” This is the same cat that went into my closet one day and started dragging out my blouses…but only the silk ones. She left the cotton ones alone. Great job on the modeling photos, very flattering lighting and cute, natural-looking poses. I love the p.j.s, they fit you perfectly and the fabric is fun. Like you, it’s hard for me to find RTW sleep wear that is long enough in legs or sleeves, but one thing I must have is pockets! I make no secret of the fact that I’m a crazy cat lady. Great pjs. Your photography is also vastly improved. Lots of effort and it pays off. It’s really nice to see the details so clearly. Thanks Nancy. I like using my blog as an opportunity to practice my photography skills. Even if I don’t get it quite right I enjoy the process. If only I could find a body double to be my model!